I saw this in my local paper and it is also of particular interest to an associate of mine so I thought I would 'blog' it. Our Man in Academia, Dr Paul, is particularly attuned to how the press seems to bury ANY positive news about the economy and how the media seems to always try to emphasize the ‘bad’. (He’s not the only one by the way). I knew he would love this one. Into the mix of economic news comes a little hit-piece by R.A. Dyer (January 2, 2008, page 4A) via our local paper, the Fort Worth Star-Telegram, once again reminding us why many locals often refer to it as the ‘Startlegram’. The article is titled: “Surprise, your paycheck doesn’t go as far as it used to. Here’s why” with the tickler “Area Hit Hard by Energy Costs”. The online version can be found here. The major problem with the story is that it claims that the impact to incomes due to energy costs has increased significantly since 2000… WITHOUT telling us exactly WHAT the impact is. The author seems more intent on presenting some rather soft data in as dramatic a fashion as possible, than in providing any real and useful insight into what changing energy costs really mean to the public. As a further indicator of some sleight-of-hand going on, the author uses about 20% of the column space presenting purely anecdotal information! The article is frankly: ‘all heat and no light”. Now, 72 percent does sound like a lot, but that averages out to 8.1 percent per year (not 10.3) over 7 years. 8.1 percent is not nearly as dramatic a number as 72 percent and somewhat less dramatic than 10.3 percent. This is not to deny it is still a significant increase when compared to the annual pay increase number given, but again, what is the real impact? More directly put: HOW MUCH OF OUR INCOME HAS BEEN AFFECTED BY THIS INCREASE? The author doesn’t say, and in fact appears to NOT want to divulge this all-important parameter by carefully arranging his argument around it. The author dances only so close as he dares to the heart of the question with: “The findings show a 55 percent increase between 2000 and 2006 in the proportion of monthly income that goes to energy.” OK, we got it. Now what does it mean? A 55% increase of ‘what’ exactly? How much real dollar difference is involved? In a nutshell, Dr. Paul would point out that the author is just giving us the change in the data, but not what the data IS. For the mathematically inclined, this is akin to giving the derivative of the function, but not the function. Again, Average Reader would incorrectly come up with around 9.2 percent (if Average Reader assumed the rather vaguely-stated “between 2000 and 2006” meant 6 years), but in reality this would actually be only about 7.6 percent per year for 6 years, Not nearly as dramatic as 55 percent, is it?. Also, note that this is the PERCENT CHANGE to the PROPORTION of income spent on ‘energy’ and is NOT the INCREASE in AMOUNT THAT IS SPENT on energy. This almost seems like intentional obfuscation, doesn’t it? Next, the author states that incomes have only risen 29 percent between 2000 and 2006. Average Reader would again (and incorrectly) just divide the percentage by the number of years to get 4.8 percent, but the real answer is a somewhat smaller 4.3 percent per year. Dr. Paul offers an exercise using two examples. This is made somewhat more difficult than it could be, because of what the author leaves out: the percentage of income spent on energy either to begin with or at the end of the timeframe. Like the word problems the author undoubtedly despised as a child, if you have ‘n’ variables in one equation, you have to have ‘n-1’ that are known to solve for the third. The author only presents the CHANGE in the percentage spent on energy and the AVERAGE amount spent on energy. The example above shows how income could increase by 29 percent and the percentage spent on energy could increase by 55% and what that means in dollars and cents to the household. As a percentage of household income, the change is between 8.4 percent (2000) and 12.9 percent (2006). Again, note that we do not know whether the data in the third column is representative or not -- since the author did not provide it. To illustrate the major shortcoming of the article, consider the following equally valid yet very different example. This time let’s assume that in 2000 the income is $70,000 instead of $23,000. Again, the second example shows how income could increase by 29 percent and the percentage spent on energy could increase by 55% and what that means in dollars and cents to the household. However, in this example the change is relatively small as a percentage of household income, and is between 2.9 percent (2000) and 4.5 percent (2006). Average Reader STILL does not know whether the data in the third column is representative (or not) since the author did not provide it. To make matters worse, the author then presents anecdotes as authoritative information. The author (apparently) interviewed two ‘people on the street,’ so to speak: a retired insurance salesman, Cyrus Francis and a telephone company employee, Pamela Bradford. Could it be that Mr. Francis has no car payment and no house payment and lives in a motor home in his retirement? We do not know and cannot tell from the article. By presenting Mr. Francis’ case, the author has committed the Appeal to Emotion fallacy. How can Pamela Bradford, who works for the phone company, possibly know what’ everybody is feeling’? This is a good example of the Appeal to Belief fallacy. Mike Brandl, a University of Texas at Austin economics professor. "What people don't realize is that the cost of living -- and especially energy costs -- are increasing faster than their pay." their pay -- and that is largely due to energy costs --. Without stating at this time whether Dr Paul or I either agree with or doubt the statement that asserts cost of living is increasing faster than pay, mine is the better phrasing because as shown here and in the graph below (downloaded 01/04/08 –it will change over time) we see that lately, overall inflation is more often than not driven largely BY energy costs. 1. That the author of the paper 'cherry picked' and truncated his time-span (shades of global warming alarmists!) 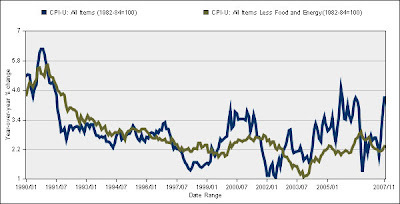 to cover the timeframe where energy costs were moving from a DEFLATIONARY influence in early 2002 to a peak inflationary influence around in 2005-6. While the terminus may have been determined by the cutoff of available statistics, the starting point was clearly selected as convenient (perhaps sub-consciously?) to suit the author’s ‘message’. 2. That clearly, if rising energy costs are driving inflation, then based upon the data the author presented, the total inflation is being held in check by factors other than energy because the data the author offers as representative of energy cost growth far exceeds the net impact of all factors in the inflation rates shown. Would it also be too simple to point out here that if Average Reader would merely overlay the author’s numbers for income growth over the same timeframe, it would become apparent that income growth probably approximated and at times exceeded the inflation rate? If from the numbers offered by the author the rising cost of living increased faster than pay overall, it couldn’t have been by much. Brandl said the cost of other basic needs such as groceries has also continued to creep up. In mid-December, for instance, the government reported a 0.8 percent increase in consumer prices -- the highest rate of increase since November 2005. Brandl said extra expenses can lead to increased dependence on consumer debt, which then becomes part of a vicious cycle and takes a toll on disposable income. "We're seeing increasing consumer debt, with the idea that consumers are making up the difference between income and spending by putting more on their credit cards, or accessing the home equity of their homes," he said. "This is very dangerous." They are seemingly intended to read ‘Wham!”,”Bam!”,”Thank-You Ma’am!”, but in reality are “Blip”, “So”, and “Oh, By the Way”. Which Brings us to the ‘So’: “…extra expenses can lead to increased dependence on consumer debt…” So? Not changing you engine oil CAN lead to excessive wear. Yes, the logic rings true: but it isn’t demonstrated to be happening in the article – So What? As written (without data supporting the assertion), this should very well be considered a form of False Dilemma. Now the OBTW: “increasing consumer debt, with the idea that consumers are making up the difference between income and spending by putting more on their credit cards”……"This is very dangerous." “The IDEA? ’ if it is -- tell us, if it isn’t -- don’t bring it up! As to “This is very dangerous"—We agree. Thanks for the tip. Another potential False Dilemma! Please note, on my end there is no real contention with the Professor’s sentiments and observations beyond perhaps whether or not pay is rising apace with the cost of living. My complaint with this portion of the article is that it appears, either via an author’s sloth or an editor’s overreach, that all meaningful relevance to what Dr. Brandl had to say is missing from the article. This article was a pure 'puff piece' designed to evoke a particular emotional response. From the comments at the Star Telegram’s website, I’d say they they’ve gotten Average Reader’s number. Dr. Paul thinks Math Teacher (in the comments) has a good idea for using the article and also plans to use it to teach statistics next semester. 2. Ambiguous averages - mean, median, mode, midrange? 4. detached statistics - a statistic in which no comparison is made - aspirin works 4 times faster - faster than what? Mr Dyer’s article is just one contemporary illustration of how statistics are used, or rather ‘misused’, by the media... and how the articles can mislead readers and woefully misrepresent the truth.